Coming to a new church for the first time can be daunting, full of excitement but also uncertainty. Everyone who comes through the door at Valley is welcome here. You don't need to be a life-long Presbyterian, you don't even need to have much church experience at all. Our worship is unique, but it reaches out to a great variety of people on many different levels. We hope you will feel welcome here from the first time you visit. We gather for worship on Sunday mornings at 10:00 a.m. Our worship order is fairly traditional. We begin with a Call to Worship, and offer our voices in praise to God in a hymn or song. Then we say a Prayer of Confession, leaving room for our own silent prayer, confident of the promises of God's grace and forgiveness. We exchange words, and handshakes, and gentle embraces, affirming the Peace of Christ in the lives of all. Next we listen to the Word of God. Often following the common lectionary, we typically we hear readings from the Hebrew Scriptures and the New Testament. The children are invited forward for a special word for them before being dismissed to their church school classes. We hear an anthem from the choir and then a sermon from our pastor. Valley has a long tradition of preaching that engages head and heart. Sermons here aim to challenge and inspire us, together, as we go about the task of living out what it means to be followers of Jesus in a world full of complexity, ambiguity, and challenge. We respond to God's Word in our lives in various ways. We affirm together what we believe, often using portions of the PC(USA)s "Brief Statement of Faith." We offer our time, talent and treasure, we share our joys and concerns with the community during prayer and say together the Lord's Prayer. On the first Sunday of each month we also celebrate the Sacrament of Holy Communion. The Table is open to all who come in faith, seeking the grace of Jesus Christ in their lives. Church membership at Valley is not required. Finally, we go out to serve God in the world, singing a song of community and commitment. At the conclusion of worship we enjoy a time of companionship during Coffee Hour. We catch up with each other on the week, and enjoy coffee or tea and a few light nibbles. We also celebrate birthdays once a month during Coffee Hour. Our music program, led by our fine music director and talented organist Max Vladimiroff, features a dedicated Adult Choir, our Handbell Choir, and our Youth Ensemble. You may find your talents and interests lead you into one or more of these groups. To learn more about our Music Ministries, click here. Our nursery is staffed by trained paid child care workers, and is available for the service each Sunday. 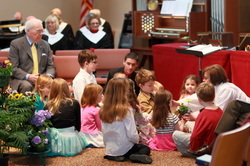 Infants to school aged children are welcome to come play after the children’s sermon. For more information on what's available for children, click here.